Some of Britain's leading doctors have urged NHS trusts to stop using complementary therapies and to pay only for medicine "based on solid evidence". 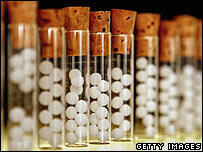 The group raised concerns that the NHS is funding "unproven or disproved treatments", like homoeopathy. One doctor told the Times the NHS was funding "bogus" therapies when patients struggled to get drugs like Herceptin. But Prince Charles has said "proven" therapies should be integrated with conventional medicine. He told the World Health Assembly in Geneva: "The proper mix of proven complementary, traditional and modern remedies, which emphasises the active participation of the patient, can help to create a powerful healing force in the world." He added: "Many of today's complementary therapies are rooted in ancient traditions that intuitively understood the need to maintain balance and harmony with our minds, bodies and the natural world. "Much of this knowledge, often based on oral traditions, is sadly being lost, yet orthodox medicine has so much to learn from it." He called on countries to look at how they could improve the health of their populations, using a more integrated approach. In their letter, from 13 doctors and sent to 476 acute and primary care trusts, is being seen as a direct challenge to the prince's campaign. Organised by Michael Baum, emeritus professor of surgery at University College London, the letter said he and fellow doctors believed alternative medicine was being promoted despite a lack of evidence and "at a time when the NHS is under intense pressure". It criticised two initiatives - a government-funded guide on homeopathy for patients, and the Smallwood report, commissioned by Prince Charles, which suggested greater access to complementary therapies in the NHS might lead to widespread benefits. The letter described homeopathy as an "implausible treatment for which over a dozen systematic reviews have failed to produce convincing evidence of effectiveness". The doctors say while "medical practice must remain open to new discoveries", it would "be highly irresponsible to embrace any medicine as though it were a matter of principle". The letter continues: "The public and the NHS are best served by using the available funds for treatments that are based on solid evidence." Signatories on the letter include Nobel Prize-winner Sir James Black and Sir Keith Peters, president of the Academy of Medical Science. Edzard Ernst, the UK's first professor of complementary medicine, also signed. He said: "The wholesale integration of complementary medicine, simply because it's alternative, and people may want it, and feel satisfied with it, is not a good reason for integration. "I believe we need one single standard in medicine and that is the standard of evidence based medicine." Dr Peter Fisher, of the Royal London Homoeopathic Hospital, described the letter as an attempt to introduce a form of "medical apartheid" into the NHS. Terry Cullen, chairman of the British Complementary Medicine Association, said: "It's very frustrating that senior responsible people dismiss complementary medicine for the sole reason that it doesn't have the definitive scientific proof that other drugs have. "There is so much anecdotal evidence that thousands of people gain benefit from using complementary medicines. We shouldn't dismiss that." Madeleine Craggs, chief executive of the General Osteopathic Council, said: "All recognise the value of evidence-based practice, but given the lack of funding for controlled trials, an interim solution may be to pilot more integrated services." One signatory to the letter, consultant clinical scientist Leslie Rose, said its purpose was to instil equal vigour in gathering evidence for every treatment prescribed to NHS patients. "The NHS should not be spending money where the evidence base is much weaker than it is for conventional treatments," he told BBC Breakfast. He said a business plan for the refurbishment of the Royal London Homoeopathic Hospital - which cost £20m to set up - did not put any emphasis on evidence. Complementary therapies also include reflexology, aromatherapy and a range of 'hands on healing' techniques such as reiki and shiatsu. Prince Charles first advocated the use of complementary medicines more than 20 years ago, and has established the Prince's Foundation for Integrated Health. A spokeswoman for the Department of Health said it was up to clinicians and trusts to decide on the best treatment for a patient. She said good evidence and clear information was required for patients to make their choice. She said the department said it did not have figures on the amount spent by the NHS on complementary medicines because decisions were taken locally. About half of GPs are thought to refer patients to alternative therapists.